This Meyer lemon chutney was inspired by Laurie Colwin, one of my favorite food writers. I read “Home Cooking” and “More Home Cooking” again and again, devouring her books like favorite comfort food. I have experimented with many of her recipes, sometimes successfully and sometimes not. I had been tempted to try her “Lemon Chutney” for years and recently set out to make it – with disappointing results. I loved the idea, though, and wanted to use some of the windfall of Meyer lemons from our tree in the garden. Meyer lemons are thin-skinned and much sweeter than other lemons, perfect for recipes that call for consuming the fruit, as well as the juice. Chutney with Meyer lemons still seemed like a potential winner to me. I ended up adapting my mother’s superb recipe for mango chutney. Laurie’s recipe uses cardamom and coriander, as well as fresh ginger, so I also added these ingredients . 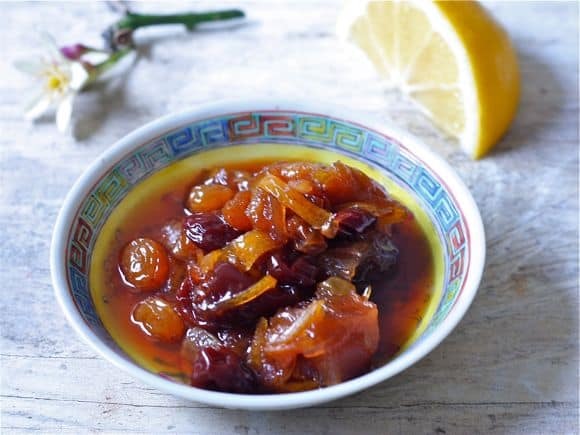 Dried cherries added a touch of sweetness to this intensely flavored lemon chutney. An intense lemon-flavored chutney, featuring Meyer lemons. Peel enough zest from the lemons and chop finely until you have 1 cup of chopped zest. Remove the white pith and discard. Cut between the membrane of the lemons to remove sections of fruit. Set aside. Using a large, heavy-bottomed pot, heat the sugar, vinegar and lemon juice until it boils. Add the zest and lemon sections, onion, raisins, dried cherries, crystallized and fresh ginger, garlic, cardamom and coriander. Bring back to a boil, then lower heat to low. Cook chutney for 2 hours, stirring occasionally. Store in sterile glass jars according to safe canning procedures. Process in a water bath for 10 minutes. Option: chutney can be stored in a covered container in fridge for several weeks. Your new site looks gorgeous Liz! And so does this chutney. Congrats! Thanks, Stephanie, the credit truly goes to Andrew. Congratulations on the new site! It looks great. And, the chutney recipe looks intriguing. I need to try this. Carol, thanks – your salsa is at the top of my list, as soon as the fruit looks “ready” in our markets. Great recipe to launch the great looking site. Meyer lemons are so Lizthechef! Just love how easy the new site is to manage. Love the looks as well. Bravo! Elizabeth, yes, Andrew made the site so streamlined – thanks so much. Liz I love the new site! Brilliant to have lemons- I trust it’s a Meyer?! Great sounding chutney also. I am always looking for new ways to use up my plethora of meyer lemons! Great idea! And the site looks lovely. I’m working on mine too! Good luck with your site – your are working with the best person! Liz, Your site is dazzling! The Lemon Chutney sounds delicious….waaaaah, I have no Meyers left on my tree! I don’t either now – someone stole ALL our lemons over the holiday. Love the new look, Liz! Gorgeous photo Liz! I love the look of the new site and the larger photos too..just beautiful. This recipes looks delightful too, I will bookmark it for later! Yes, the site embodies everything you are:) My local Persian store has Meyer lemons at a great price and I bought a few. I am definitely going to make this chutney! What dishes are best complemented by it? Lana, thank you for the comment I have been waiting for because I want this site to be very “Liz”. Meyer lemons are terrific with poultry, fish, salads and almost any vegetable dish. I use them in vinaigrette instead of vinegar, in my iced tea, sparkling water – etc. Love your new look, LIz – so bright and sunny – the vintage photos really pop! I intend to make an appointment with Andrew once I get settled (big move this weekend). Meyer lemons are perfect with about anything – but I haven’t seen any in the markets for a month or so. Lucky! Good luck with your move and thanks for the visit. I LOVE Tjs’s mango chutney. Ironically I just posted today about canning!! I was reading a site about the French method vs. American and they don’t actually process jars in water bath. They just invert them. If you’re into canning, you may like to read it. I would love to try this chutney of yours!! I usually do the French version myself, but lots of folks here are uncomfortable with that method. If you like TJ’s mango chutney, you might like mine and I will give you some next batch – promise. Kim, thanks – it was a stressful time but well worth it. AFter a week, it has mellowed – still intense but very “spoonable” from the fridge. Serving with roast chicken tomorrow night. A windfall of Meyer Lemons…..I can’t think of anything more fabulous! Just lucky to live here – homesick for NYC and Eastern PA where we visited a year ago. WOW! I can smell the flavors & aromas right now. I’ve never made a lot of chutneys, outside of the winter holidays. I will have to try this one out! Thanks, Liz! I ate a whole jar by myself – very lemon-y. Looks great, but I have one question. You say to “peel the zest.” Do you mean to just peel the lemon (and make sure to not include the pith)? When a recipe calls for zest I use a microplane zester, which gives me a super fine zest, which I can’t imagine chopping or ever having a full cup of it! I use a wide vegetable peeler, peeling only the zest and then cut it into thin strips – I don’t use my microplane here. I’ve made plenty of jams and jelly’s before. I’ve also made chutney once. but the consistency of chutney (as I recall) should be thick and chunky, not soupy. I followed the directions as written, but have 4 jars of fragrant and tasty, but very soupy “chutney.” What exactly binds these ingredients together? Do you think I could pour this all back into a pot and cook it with pectin? Any ideas? Mine is always very syrup-y so I don’t know what to suggest. Perhaps cook it longer? I am not much of a pectin expert but that’s an idea. I think cooking it longer might work best – sorry for your troubles! The chutney is very good. The chutney turned out to thick. So next time I will simmer60 minutes. I like my chutney thick but am glad you made the recipe work for you. Katherine The chutney I made was so thick that I could not get it off the spoon. I remade it. After simmering the second chutney 35 minutes. I add the first batch.